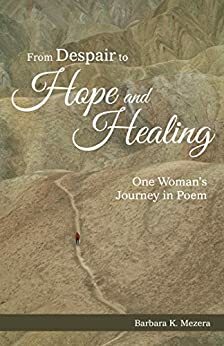 From Despair to Hope and Healing is a poetry book by Barbara K. Mezera. When reading this book of poetry, you can see that it follows through the various stages of the author’s life. The book is conveniently set up through different sections, with an explanation for each section beforehand. The poems are deeply personal, giving details of life and their emotions. This deeply personal collection can resonate with anyone who has dealt with dark feelings and had inner battles of a profound and personal nature. I was not prepared with how raw, real, and deep the poems got. Even though this is a book of poetry, it tells a story in a way. It is an incredible personal journey that tells the story similar to a novel. This book is not just a book of poetry, but an autobiography of sorts, where the author’s feelings and thoughts jump off the page at you. These poems resonated within me in so many. I think that anyone who has struggled or had mental health issues can relate to it. One of my favorite lines from the book is “gaining six inches only to slide back four.” It is such a universal feeling. When you have fought to get so far and then something happens where you are going back and have to fight to get back to where you were. You know poetry is good when the underlying meaning and message can be grasped by anyone and the emotions are felt universally. One of the poems talks about being grateful. Mezera writes about the many different things that can cause heartbreak or even depression, but to be grateful for them. I think this is one of the more thought-provoking poems of the bunch. This poem really got me thinking about how everything, no matter what I have been through has made me the person I am today. In a way, I am thankful for those things. But then there are the truly horrific aspects of life that I do not think people can say they are thankful for. It had me thinking about it for quite a bit, which is something I enjoyed. I would say this is a splendid collection of poems. Not only does it have what someone would want in a poetry book, but it also tells a story in a unique way. I have never read a book that could tell me about a person’s life in such an intimate way that reveals the author. I absolutely love that it was a personal autobiography in a way.